Gunpla modeling is all about creativity. The more modifications you do, the more your own personal style will show in the final product. 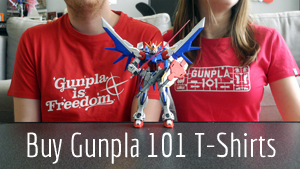 In this tutorial, Gunpla 101 contributor Miko shows us how he used a time-tested technique to create a Gunpla look that’s all his own. One of the most fun parts of working on a model kit is painting it. For me, all that time spent prepping, cleaning, and modifying a kit pays off when it’s time to bring it to life with color. There are a lot of ways to approach the painting phase, and none are incorrect. Some modelers paint by hand while others use spray cans. But my favorite technique involves a tool that has become increasingly more affordable over time—the airbrush (I use my personal workhorse: the Tamiya HG-T Trigger Type). While airbrushing is similar to spray-painting in some ways, it allows me a lot more freedom to experiment with style. From pre-shading and post-shading to zenithal lighting or color modulation, these are all great ways to exercise your airbrush muscles and practice new looks for Gunpla kits. Through trial and error, I’ve developed an airbrushing method based on a tutorial I came across two years ago in a magazine oriented toward military scale modeling. It’s a variation on what many modelers call the Black and White Technique, in which you begin with a white base and then fill in black paint—or vice versa—in order to create realistic light and shadow. It’s a great way for beginners to get familiar with their new airbrush and its capabilities. Today I’m going to tell you about how I utilize the Black and White Technique specifically for Gunpla kits. If you’re one of the many builders out there who has felt the call of the airbrush, I’ve outlined a little tutorial that you may find useful in painting up your kits. This technique is great for most paints, but for this tutorial, I’ll be using fast drying, fast curing lacquers (mostly Gaia and Mr. Color) because I normally have little time to work on my models before I go to bed and head to work the following day. For this tutorial, I documented part of my work process on the HGFC Shining Gundam, focusing mainly on the torso as it’s the most colorful part of the model. Next, you need to prepare the model for painting with a primer. A primer is a base coat, usually gray, that helps your paint better adhere to the model and last longer. I use a local made Philippine brand called DS Primer, but Mr. Finishing Surfacer 1500 does the trick as well. As a side note, for the shadow color on yellow parts, I always use a dark brown (Gaia Color Natural Brown in this case) for a more realistic, warm-toned look. The next step is laying down the highlights. You’ll want to use a very bright white paint, thinned to a consistency slightly thicker than milk. Carefully pick spots out on the model that will catch the light. The more you concentrate white on an area, the brighter the final color will look. For this kit, I used Gaia Color Semi-Gloss White, as it was what I had on hand, but if you can, grab some Gaia EX-01 White or Mr. Color GX 01 White. Some people at this stage may notice the similarity between this step and the steps in painting using Zenithal Lighting Technique (something usually exercised on wargaming miniatures). The difference here is instead of designating one key light source with Zenithal lighting, here you pick out parts you wish to emphasize. Think of it as spotlighting: not completely realistic, but hey, we’re out here painting models of fictional giant robots. The second-to-last step is the most fun because this is where you’ll see the fruits of the previous steps. Begin by making batches of paint with a thinner-to-paint ratio that’s higher than the mix you used for the previous highlight layer. Prepare a mix for each of the colors you’ll use. Do this in successive coats, letting each coat touch dry before proceeding. Take note that the more layers you add, the more opaque the color will become. If you do this with clear colors to begin with, you will get more mileage, but doing so with really thinned down opaque/normal color paints will give you more varied choices. I prefer the latter because of the muted, 3D computer graphics effect it gives when done well. Finally, it’s time to fill in the detailed paintwork (applied Vallejo Model Color for that), decals, and panel lining (done using Gundam Real Touch Marker: GM401 Gray). Let it dry overnight and assemble. You can pretty much stop right here, topcoat the model with your choice of finish (I used Tamiya Acrylic XF-86 Flat Clear) if you intend to make a clean model. ….However, if you choose to add effects like say, weathering, the subsequent dark washes and effects will give your model even more tonal variation. The Black and White Technique as seen on Miko’s HGUC RX-78-2 Gundam Revive with weathering. The Black and White Technique as seen on Miko’s HGIBO Gundam Barbatos with weathering. Whatever finish you choose, with a little bit of practice your paintwork will begin to achieve a more advanced-looking result. You’ll begin to see this even if it’s your first time trying this technique! But the best part of learning a new technique is that with each subsequent attempt, the results look better and better. Hopefully, this tutorial helped you out on your own models, or at the very least makes your builds stand out a little bit more. Happy building! Miko, AKA Moki Plamo an avid Gunpla fan from the Philippines. He’s been interested in the hobby since getting his first SD kit back in 1994. You can catch his shenanigans over at his Facebook page. Ask Gunpla 101: Do I top coat first, last, or both?